Voice’s Highfill recognized among E&P’s 25 under 35 The awards just keep coming for Stephanie Dodson Highfill of the Hot Springs Village Voice. Highfill, last year’s “Best of Show” winner at the Arkansas Press Association’s Better Newspaper Advertising Contest, was selected for a prestigious national honor in 2019. She’s one of the 25 young newspaper professionals nationwide honored on the Editor & Publisher “25 under 35” list. Highfill is a self-taught graphic designer. She watched internet tutorials about Adobe software such as InDesign, Photoshop and Illustrator to learn her craft. In learning design, she brought specific skills and added value to her role in advertising sales at the newspaper. Designing spec ads before she goes to see a client tends to lead to better sales results, she said. Gov. 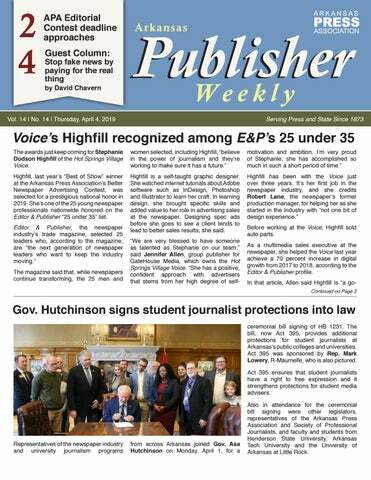 Hutchinson signs student journalist protections into law ceremonial bill signing of HB 1231. The bill, now Act 395, provides additional protections for student journalists at Arkansas’s public colleges and universities. Act 395 was sponsored by Rep. Mark Lowery, R-Maumelle, who is also pictured. Act 395 ensures that student journalists have a right to free expression and it strengthens protections for student media advisers. Also in attendance for the ceremonial bill signing were other legislators, representatives of the Arkansas Press Association and Society of Professional Journalists, and faculty and students from Henderson State University, Arkansas Tech University and the University of Arkansas at Little Rock. Highfill’s win in the 2018 APA contest was referenced in the Editor & Publisher report. She won “Best of Show” for the ad, “Life without Limits,” that features a runner wearing a prosthetic leg against a backdrop of a lake surrounded by mountains. The ad was for Felix Brace and Limb. Highfill started working for the Voice in October 2015. A graduate of Cabot High School, she attended Arkansas State University at Beebe. She and her husband, David, and family live in Lonsdale. Researcher seeks APA Better Newspaper Editorial survey data Contest deadline approaches A media researcher looking into the methods and strategies used by newspapers in the emerging digital age is asking newspaper industry professionals to answer a short survey. 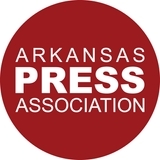 Journalists, photographers, copy editors and newspaper page designers have just two weeks to submit their best work from 2018 in the Arkansas Press Association Better Newspaper Editorial Contest. Dr. Jason Steele has requested that Arkansas Press Association members answer a brief, four-minute survey about digital transformations. For example, one of the questions relates to the creation of a mobile app. The contest entry deadline is April 19.
college admission with their internship application. About two dozen student journalists have been placed at APA newspapers in the last seven years. Host newspapers have included the Times Dispatch in Walnut Ridge, the Northwest Arkansas DemocratGazette, the Daily Record, Carroll County News, Nashville News-Leader, Harrison Daily Times, South Arkansas Sun, Sheridan Headlight, Russellville Courier, Texarkana Gazette, Pine Bluff Commercial and Yell County Record. Potential interns will submit an application that is forwarded to prospective newspaper employers for review and acceptance. Newspapers must complete applications to participate in the matching grant program by April 19. Contact the APA’s Terri Cobb at (501) 374-1500 or email terri@ arkansaspress.org for more information. to pay news publishers for access to the quality journalism that users need and value? of Media and Journalism found that more than 1,300 American communities have completely lost sources of local news. Facebook and Google could address these risks by embracing responsibilities and becoming partners, rather than minor benefactors, for journalism. They need to come to the table with a real deal on revenue, data and algorithms. Jonah Peretti of BuzzFeed has talked about digital publishers merging to gain more negotiating leverage over the tech platforms on these issues. Legislation sponsored by Rep. David Cicilline, a Rhode Island Democrat, would allow news publishers to collectively negotiate with the two companies without violating antitrust rules. Facebook and Google talk incessantly about how they are improving the world. Why not do something genuinely good for all of us and support journalism instead of destroying it? And it wouldn’t even have to be that hard. There is plenty of money and quality content to go around. All it would take is a little enlightened self-interest and a real commitment to the continued existence of quality news. David Chavern is president and CEO of the News Media Alliance, a trade association representing some 2,000 news publishers in the United States and Canada. This column first appeared in the New York Times. Follow him on Twitter: @NewsCEO. Requires reporting from physicians and healthcare facilities requiring detailed information about abortion procedure complications and exempts the required report from the Freedom of Information Act.